There was a time in the not-so-distant past when building a 1,000-horsepower engine combination was a moonshot. While it could be done, there was a price to be paid; deep pockets, the expectation of broken parts along the way, and a high tolerance for frustration, anguish, and retracing your own steps were the currency involved. Today, though, while it’s still an accomplishment that requires a bit of planning and a certain level of disposable income, it’s not uncommon to see four-digit power in street-driven cars, not just race cars. The key to achieving our thousand horsepower goal is this 4.5l Whipple supercharger perched atop the LSX376-B15 engine. Even Chevrolet Performance is getting into the act – besides offering turn-key crate monsters like the Z/28’s 505 horsepower LS7, the supercharged, 638 horsepower LS9, and the insane LSX454R race engine that is rated at 770 horsepower and 612 foot-pounds, they also catalog a unique pair of LSX376 long blocks designed specifically for boosted applications. In our previous installment, we showed you how our LSX376-B15 went together at Chevrolet Performance. Today, we’ll look at the key component that will provide the boost for our journey to a thousand horsepower and beyond; a Whipple supercharger. The choice of Whipple for our build was a sensible one, as they are the supplier of superchargers for the two blown factory COPO Camaro configurations. Unlike the COPO cars, though, we aren’t limited in our choices by class rules or limitations, so rather than the 2.9L or 4.0L superchargers that top the 500 and 550 horse COPO engines, we’re going to step up a bit in blower displacement so we can reach our thousand horsepower goal. While our selection from Whipple, the W275AX compressor, is visually similar to the 4.0, it displaces an additional half-liter of air every revolution. In addition to the supercharger itself, Whipple also supplied their elliptical throttle body, and the integrated intake manifold and air-to-water intercooler that mates the blower to our LSX376. To add to the fun, we had an assortment of supercharger pullies to use, to vary the drive ratio, ranging in diameter from 5 inches to 4. The smaller the pulley, the more the step-up ratio of crank rpm to blower rpm. While smaller pullies mean more boost, there are limits beside lost efficiency – Whipple notes, “Maximum sustained RPM is 16,000. For racing and street applications, max intermittent RPM is 18,000.” At 18,000 RPM, our W275AX will be pushing 2,800 cubic feet of air per minute. With the right engine underneath it, Whipple says this supercharger will support 2,000 horsepower. “We have a project coming that will do just that,” he hints. Our thousand horse goal should be well within the limits of our chosen blower. There are two basic types of superchargers in the automotive world today: Centrifugal, and positive displacement. Centrifugal superchargers, which incidentally include turbochargers as they are technically a supercharger driven by exhaust energy rather than mechanically from the crank, dynamically produce airflow and pressure by slinging air via an impeller. There is no fixed relationship between the rotation of a centrifugal supercharger’s compressor wheel and the amount of air moved. Positive displacement superchargers, as implied by the name, positively displace a certain volume of air from their inlet to their outlet with each turn of the rotors. In the case of our Whipple, that volume is 4.5 liters. Of course, not all superchargers are created equal, and positive displacement designs tend to have certain characteristics that make them desirable for automotive use. One major characteristic is that they help build power all through the engine’s RPM range, while centrifugals tend to work best higher in the power band. Even among positive displacement superchargers, they aren’t all the same. For example, the venerable Roots design achieves boost by essentially shuffling air molecules from the inlet to the outlet while preventing them from making the return trip, like field trip kids through the turnstile at the zoo. Air pressure builds in the intake manifold because those kids air molecules are piling up in there waiting for the intake valves to open so they can rush into the cylinders. Unlike a Roots blower, the Whipple rotors actually compress air within the housing. The LSX376-B15 is delivered without engine management, leaving the end user to determine what they would like to use for an ECU. For this project, we selected the Holley Dominator EFI system. It’s got features like integrated support for dual channel wideband oxygen sensors, the native ability to control drive-by-wire throttle bodies, twelve channel injector and ignition coil control, the ability to manage GM electronically controlled transmissions like the 4L80E, and plug and play control for both 24x and 58x LS engines. The Dominator EFI system is so capable that it’s what we are using on Project BlownZ, our seven-second drag radial race car. The Dominator’s extensive list of features, combined with our familiarity with the software for tuning, made it an obvious choice for the LSX376. To keep things simple, we also selected fuel injectors from Holley, going with 120-pound-per-hour low impedance units (PN 522-128) that are rated to support up to 1,900 horsepower per set of eight – more than sufficient headroom for our thousand-horsepower target, without being so large that they’re impossible to tune at idle. 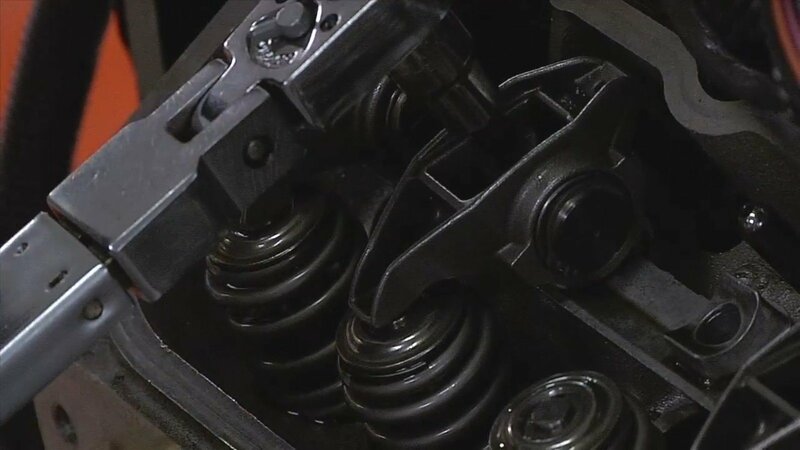 A stock truck-style pan was scrounged up and bolted to the engine, which then received break-in oil and special gear oil for the supercharger. 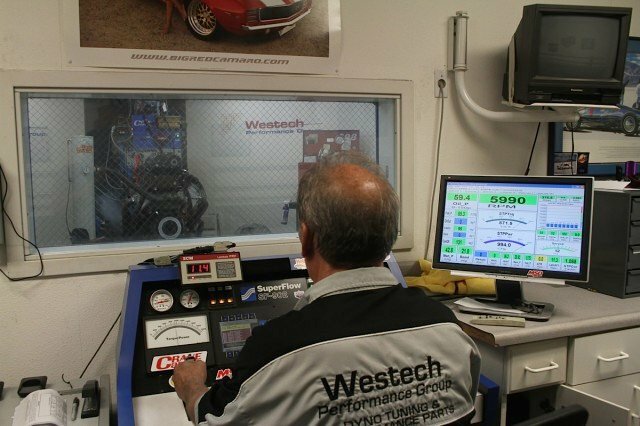 To handle the task of tuning and testing our LSX, we enlisted the aid of Steve Brule and his crew at Westech Performance Group in Mira Loma, California. If the name sounds familiar, that’s because Westech has long been the go-to resource for west coast media types like us when we need to run an engine dyno test. They have the capability of doing both engine and chassis dyno testing, and their two Superflow-equipped dyno cells are always busy with one project or another. In order to get our LSX376 ready to run, there were a few details to attend to first. The basic crate engine ships without an oil pan – since Chevrolet Performance doesn’t know what chassis you’ll be dropping it into, or if you are planning on running a dry or wet sump configuration, it makes sense to leave that off and only provide a dust cover for shipping purposes. A borrowed LS truck pan and pickup got bolted up, in order to keep all the Driven Racing Oil break-in formula from just falling straight through, and a bit of air pressure was applied to the dipstick tube to encourage the oil to make its way to where it needed to be before we started the engine up. To provide lubrication, we turned to Driven Racing Oil’s BR (for break-in) formula. It’s a conventional oil to help promote ring seating, and it contains the optimum levels of zinc and phosphorous to protect the cam and valvetrain while everything gets to know each other. Driven offers several different choices of viscosity in their BR line to match your engine’s bearing clearance. After the initial break-in, we’ll switch to Driven’s synthetic formula oil to help keep our engine running smoothly. Next, we needed to get a source of spark set up, so off came the gorgeous red LSX376 valve covers, and on went a spare pair of stock ones complete with factory coils. Finally, Brule and his crew swarmed around the dyno-mounted engine screwing in sensors, attaching fuel lines, running wire harnesses, and hooking up the Dominator EFI system. A last once-over to make sure everything looked right, and we were ready to fire the beast up for the first time. A set of American Racing Headers for a fifth-gen Camaro were enlisted to carry off spent gasses. The Dominator EFI system is capable of handling anything up to and including full race engines, as well as street-driven cars. 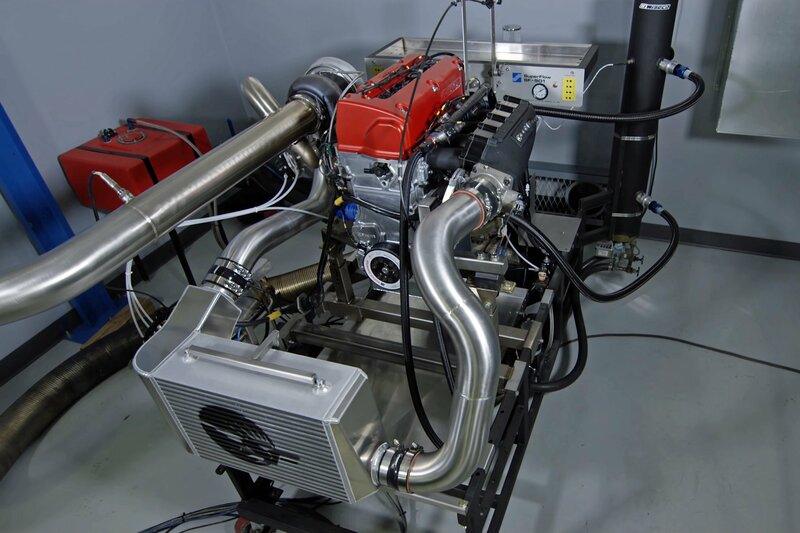 Since Westech has extensive experience with the Dominator EFI, and had previously done the testing on another LS with a similar displacement and blower configuration, it didn’t take very long to get our LSX376 to start and idle. Brule began making careful, low-rpm pulls while the fuel and spark curves were fleshed out, and once everyone was satisfied we weren’t going to see a spontaneous dry sump conversion because we’d gone off the map, the fun began. The first discovery was that even with the big, 5-inch diameter pulley and stock cam, this engine had torque like a steam locomotive. So much, in fact, that it was impossible to begin the dyno pulls below 4,500 rpm because the dyno’s power absorber wasn’t able to hold the engine back below that point – the water brake was at 100% servo, and the engine could pull through it at low rpm. With that hard floor established, Brule began creeping higher and higher up in the rev band while keeping a close eye on fuel pressure, injector duty cycle, and air/fuel ratio. The next moment of drama came when we realized that the 14 or so pounds of boost we were seeing was “blowing out” the spark as the revs climbed toward 6k – at the first hint of a burble, Brule chopped the throttle and took the load off to make sure nothing untoward was about to happen. After the phenomenon repeated itself again on the next try, the Westech crew pulled the plugs, and upon seeing that their heat indications were good and that there was no sign of detonation, closed the spark plug gap down slightly from the stock .040-inches to .035, and put them back in. With everything ready once more, the pull began. Winding the LSX376 between 4,500 and 6,000 rpm, we saw a peak of 858.1 horsepower and 15 pounds of boost, and a torque “curve” that was more like a torque “straight,” with a peak of 725.3 foot-pounds. Satisfied with how the engine and blower were performing in this low-boost configuration, and aware that even picking up another five or six hundred revs at the top of the pull wasn’t going to get us to our four digit goal, we grabbed the 4.25-inch pulley from our selection and swapped it on in place of the 5-inch we started with. Unlike most factory supercharger setups that require a pretty substantial puller tool to switch pulleys, the Whipple’s is held on to the snout with a set of bolts, and swapping takes just moments. While he was in the dyno cell, Brule also took a moment to readjust the belt idlers to maintain good “wrap” on the pulley – although the drive system has an automatic tensioner, it works the best with the least slippage when the idler takes up most of the slack, and gets the belt in contact with the maximum circumference possible. With everyone back out of the dyno cell, Brule hit the ignition once more, and the 376 barked back to life. Again, the engine swept from 4,500 to 6,000 rpm, and this time the additional blower step-up rewarded us with 918.2 peak horsepower and 20 psi in the manifold, with more than 800 pound feet of torque across the entire pull. Thanks to the four-bolt attachment of the pulley to the Whipple’s drive snout, changing them doesn’t require a puller. Note how much belt wrap there is. This engine has a 24 month, 50,000 mile warranty when used as recommended, so it’s in GM’s interest to give that conservative 15 psi max rating. To digress for a moment, a lot of people get hung up on the boost pressure number, and the fact that GM comes out and says that this particular engine is suited for “up to 15 pounds of boost” will certainly reinforce that concept here. At 20 psi, we were already well past the magic number, but the engine was showing no signs of distress. There’s a couple different things to consider here. First, there’s the fact that this engine has a 24 month, 50,000 mile warranty when used as recommended, so it’s in GM’s interest to give that conservative 15 psi max rating. Second, and more importantly, while the concept of manifold pressure is all tangled up in our heads with how much power an engine makes, it’s really a measure of how much restriction there is between the supercharger and the cylinders. 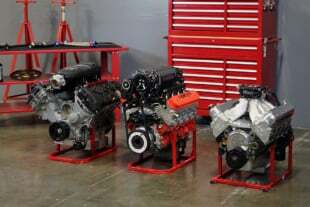 Better engine airflow will mean more power at a lower psi number, as we’ll see in our third installment when we swap the factory LS3 cam for one more suited to high boost, so not all pounds per square inch are created equal. The real difference between the LSX376-B8 and the -B15 is how much dynamic cylinder pressure they’re designed to handle, but because that is more or less impossible in practice to directly measure, we end up referring to the only-somewhat-related boost pressure figure. That one’s easy to keep an eye on with a $30 pressure gauge hooked up to a vacuum port, so it’s a convenient if somewhat misleading way to talk about the stress the engine is under. We were within sight of our thousand horsepower goal, but once again, winding the engine higher wasn’t going to get us there, so we paused to switch to the smallest-diameter pulley in our bag of tricks, the 4-inch. With the idler once again readjusted for maximum wrap, Brule began making pulls. Initial results were promising, but the air/fuel readings were starting to creep up, and the injector duty cycle required to correct it meant pushing them beyond 80%, the point at which they effectively have no time to close and simply “go static” at 100% capacity. A look at the datalogs revealed an interesting fact: Our 376 was slurping down so much fuel, it was actually outrunning the dyno pump’s ability to keep up. Another pause ensued to replace the high capacity, but well-worn electric fuel pump with a brand new one, and testing resumed. With the new pump humming along and the boost-referenced fuel pressure regulator reset to the desired psi, suddenly the fuel injectors were in a happier place, and testing could resume. Maps dialed in, Brule put the hammer down, and we watched the numbers climb. Thanks to the fuel system now running at full capacity, we had the headroom to rev the engine a bit higher, and Brule took the 376 up past 6k – with the power output still climbing, he ended the pull at 6,600 rpm, and a peak of 1,025.4 horsepower and 884.7 foot-pounds of torque with 24 pounds of boost. We had achieved our goal, and just as importantly, we’d proven that the LSX376-B15 has the guts to withstand almost ten psi more boost than the name implies. With our four-digit goal for the LSX376/Whipple combination met, our next task is to see what a custom grind camshaft from Crane will do for this high-pressure monster. By letting the engine breathe free, we are hoping to unlock even more horsepower while using the same pulley, and actually running less boost. Stay tuned for the thrilling results in Part III! 1,000HP LSX376-B15 Part 1: Building The Long Block At Chevy Perf.